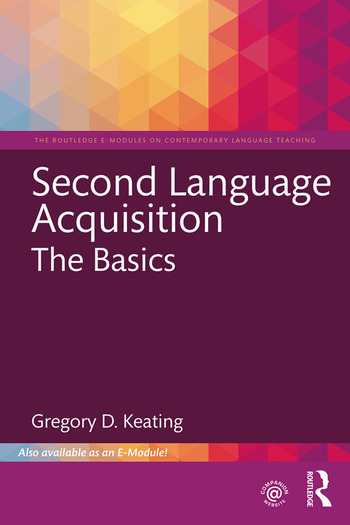 Starting from the premise that language instruction should be informed by how humans learn language, this module on second language acquisition (SLA) aims to provide teachers at any level with a comprehensive and up-to-date introduction to the key findings about how second languages are learned in adulthood. This module explores a variety of topics, including the mechanisms in the mind responsible for language acquisition, the roles that input and output play in acquisition, and how language develops in the learner’s mind over time. Furthermore, the module explores the many factors believed to impact the outcome of SLA, such as the role of the native language, individual differences in aptitude and motivation, and age of acquisition. Gregory D. Keating is Associate Professor of Linguistics in the Department of Linguistics and Asian/Middle Eastern Languages at San Diego State University, USA.